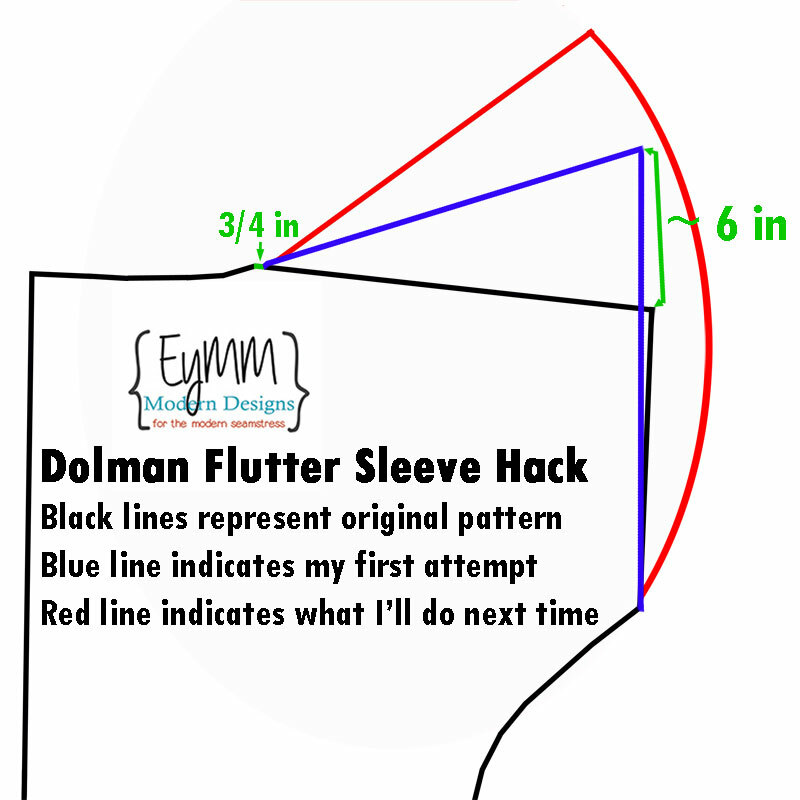 Dolman Flutter Sleeve Hack Attempt #1 – Everything Your Mama Made & More! This week, I attempted a flutter sleeve hack on Kymy’s Dolman. I say attempted because I’m not quite satisfied with my result and am going to try again, but thought you all might like to follow along on my first try. This first attempt at hacking a flutter sleeve isn’t terrible, but it’s a bit understated for what I had in mind. See, I was imagining a much bigger swing that would flutter more. 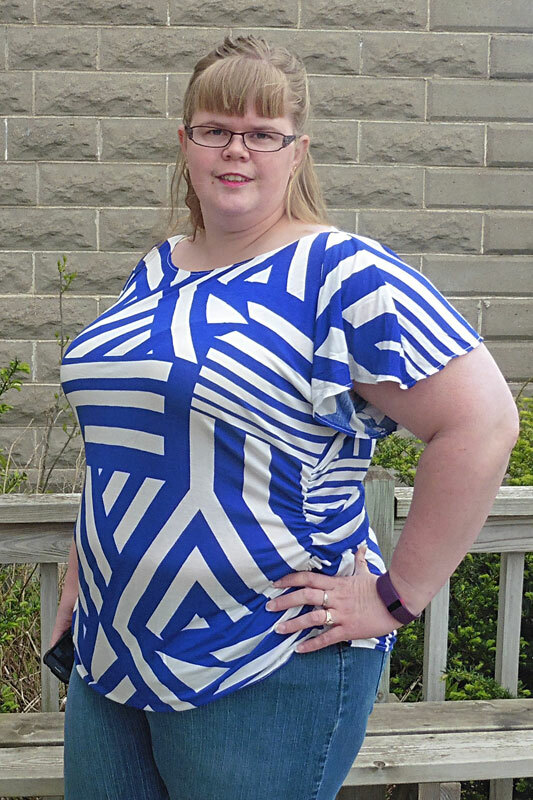 I wanted a fun top to wear this spring and, while this one will get worn, I’m going to try again for a more dramatic flutter. Here’s a mock-up of how I made the sleeve fluttery on this version and you can see that I’ve already made a new plan for the next attempt! The first thing I did was measure over 3/4 inch from the edge of the neckline to allow room for hemming the neckline. From that point, I swung the shoulder seam upwards so that the end of the sleeve was about 6 inches higher than the original (see blue lines in above drawing). I redrew the end of the sleeve in a straight line from the end of the new shoulder seam down to the top of the underarm curve. After adding this to the front and back, it would result in about 12 inches of extra on each sleeve. In my head, that sounded like plenty of flutter. After making it up in fabric and trying it on, I realized that it wasn’t quite enough extra fabric. Next time I’m going to swing it up somewhere between 9 and 12 inches higher than the original (see the red lines in the above photo). I also had the thought that curving the end of the sleeve would add more fabric to the hem and make a more dramatic drape (similar to how a circle skirt drapes since there’s more fabric at the hem than at the top). 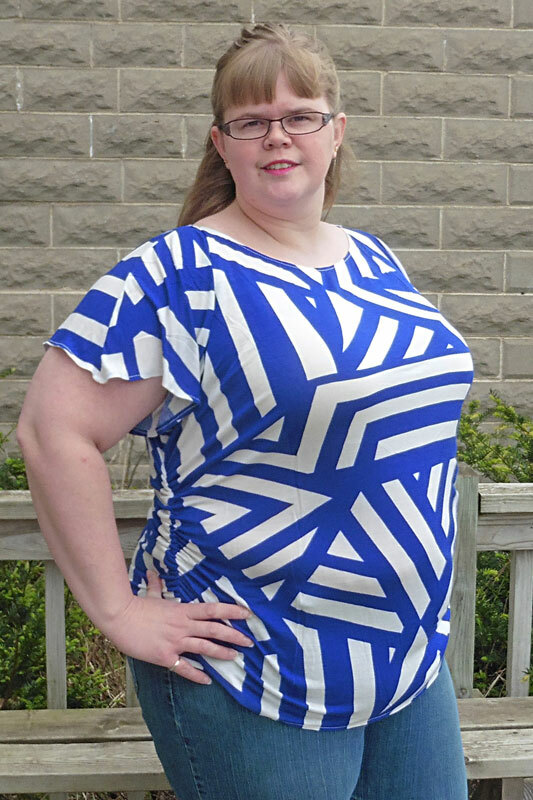 The only other change I made to Kymy’s Dolman this go-round was to lower the front neckline. I simply scooped it about 1.5 inches lower in the center front and curved it up to meet the original neckline ends.